Traditional Gutters are k-style and half round. They are very common and help to maintain a low cost keep a project within budget. Traditional Gutter systems comprise the tried and the true designs in roofing history. These systems have demonstrated industrial excellence and have been rewarded by their tradition of responsible performance. K-Style Gutters also known as Ogee Gutters are usually attached to the fascia board by virtue of a variety of fasteners for different job situations and/or preferences. A K-Style Gutter (Ogee Gutter) is a traditional styled gutter system. 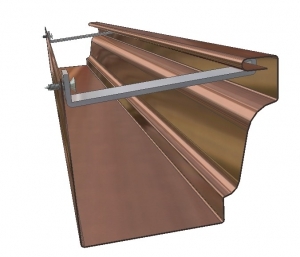 The K Style copper gutter, when it is not attached to a vertical fascia board but is hung in the way half round gutters are designed to be mounted, may need to be supported with more hangers than usual to be strong enough in such an application. We roll form copper ogee gutters in any lengths that can be shipped seamless. with our 26 ft computerized brake we can match any profile copper kstyle gutter. 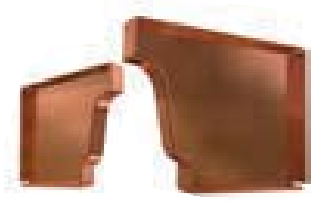 whether you need 3k or 9k that is not a problem for B&B sheet metal the only choice for your copper gutter needs. K-Style Gutter Hangers are the brackets that provide strength for and help to support the gutter system. The K-style hidden gutter hanger will help to conceal itself while keeping up the maintenance and life of the gutter. K Style Hidden Hangers are nailed or screwed through the back of the gutter and into the fascia board. However, the hidden k-style gutter hanger does the job without any visual proof to the naked eye. In fact, this well-concealed cover helps to support and strengthen the gutter system with stealth but never compromises performance mandates. K Style Left or Right End Caps is placed on the end of a section of gutter. Our K Style End Caps are tailor fitted to match aesthetically and functionally with our K Styled gutters. Our Left or Right End Caps are among the strongest and most durably constructed pieces of roofing components available. The End Caps help tpo fortify joint integrity and our K Style End Caps crown the junctions that are otherwise the most vulnerable. Act as additional protection for the miter joints. Miters are used to connect two gutters together at the corner.